On a warm September evening in Columbus, Ohio, panicked witnesses called police to report that a group of boys had robbed a man at gunpoint and fled into a maze of alleys and fences on the city's east side. In the fading light, Officer Bryan Mason cornered two of the boys in an alley, where, according to police, 13-year-old Tyre King pulled a gun from his waistband. Mason fired three rounds striking the teen in the head, chest and torso. The black gun police recovered at the scene looked like their own department-issued, polymer-framed Smith & Wesson Militaryand Police semiautomatic pistol. It even had a laser sight. But police would soon learn that King's weapon was a BB gun — a facsimile of the gun Mason used to shoot and kill the teen. 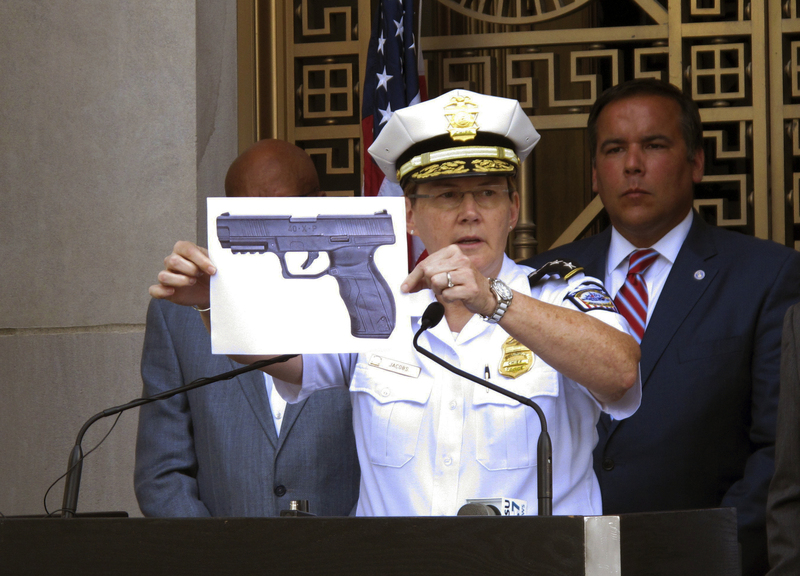 At a news conference the next day, Columbus Police Chief Kim Jacobs waved a stock photograph of the BB gun. "Our officers carry a gun that looks practically identical to this weapon," she said. "... It looks like a firearm that could kill you." In this Sept. 15, 2016, file photo, Columbus Police Chief Kim Jacobs holds up a photo showing the type of BB gun that police say 13-year-old Tyre King pulled from his waistband just before he was shot and killed by police investigating an armed robbery report on Sept. 14, 2016, during a news conference in Columbus, Ohio. King was struck three times on the left side of his head, chest and abdomen, according to an autopsy report released Thursday, Nov. 10, 2016, by Franklin County Coroner Dr. Anahi Ortiz. Such encounters have led police to shoot and kill at least 86 people over the past two years, according to a Washington Post database of fatal police shootings nationwide. 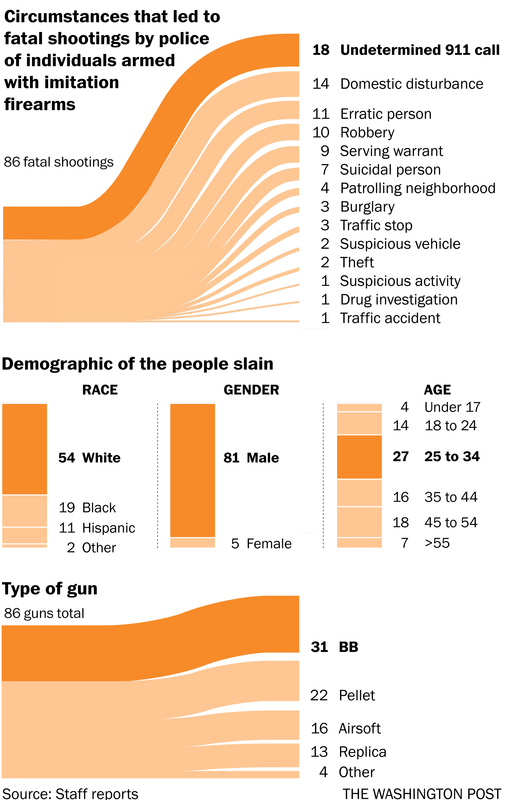 So far this year police have fatally shot 43 people wielding the guns. In 2015, police also killed 43. Police recovered a wide variety of the weapons in the fatal shootings, but almost all had one thing in common: They were highly realistic copies of firearms. Of those, 53 were pneumatic BB or pellet guns that fire small-caliber metal balls or pellets. Maurice Cardwell, Tyre King’s father, wears a pin in remembrance of his son during an event on what would have been King’s 14th birthday on Dec. 7. Another 16 were Airsoft guns, which use compressed air cartridges to fire plastic BBs. Thirteen were replicas, two were toys, one was a starter pistol and one was a lighter. "They are red hot," said Tom Gaylord, an industry consultant who runs a popular blog for the Ohio-based Pyramyd Air, one of the largest air gun retailers in the country. Pyramyd Air declined to comment. Efforts to stop production of the guns or radically alter their appearance have mostly failed because of heavy resistance from gunmakers and gun rights groups, such as the National Rifle Association. "We're talking about this 26 years later, and I'm not sure anything has really changed except that tragic occurrences continue to happen," said Chuck Wexler, who runs the Police Executive Research Forum, a policing policy think tank that studied the issue in 1990 for Congress. "A toy gun in a country with 300 million real guns is hard to distinguish." Of the 86 fatal shootings involving imitation firearms since 2015, the most common theme was mental illness: 38 of those killed had a history of it, according to their families and police reports. Fourteen of the calls were domestic disturbances. Another 10 began as robberies. The remaining circumstances range from patrolling neighborhoods to serving arrest warrants to making traffic stops. Half of the shootings happened at night. In almost every case police said the victims failed to comply with an officer's orders. "Some of them broke down in tears," Alachua County Sheriff Sadie Darnell said. "It's not a high-five situation. It's a devastating career-long and lifelong impact." In 60 cases, police said they pointed guns at officers. Among the dead are Ernesto Flores, a mentally distraught 52-year-old man who after a standoff with police in April 2015 stepped out of a pink stucco home in Montclair, Calif., holding a BB gun. Police opened fire, killing Flores in front of his family. One of only five women killed by police was 17-year-old Shelly Haendiges, who was shot in Kokomo, Ind., after police responded to a robbery call and found her pointing a pellet gun at a store clerk. Her family said she suffered from mental illness. The BB gun recovered after police killed King, the Ohio teenager, was made by Umarex USA, one of the largest air gun and firearm manufacturers in the world and the self-proclaimed "king of replicas." Umarex makes air guns under the Beretta, Colt, Smith & Wesson, HK, Ruger and Browning brands. It sells BB guns that are copies of such firearms as the iconic Colt Peacemaker, which was first produced in the 1870s, and the Heckler & Koch MP5 submachine, a mainstay of specialized military and police units. The Umarex 40XP BB gun that King allegedly brandished sells for about $50 in stores, including Walmart. Gunmaker SIG Sauer makes air guns that are advertised as "carbon copies" of their most popular lethal firearms, including the P226 semiautomatic handgun. A commercial on the SIG Sauer website displayed the BB gun and the lethal P226 as reflections of each other in a mirror. Michael E. Hammond, a legal adviser to the pro gun group said the alterations never seem to be enough for those who dislike guns. "It all arises out of this general animus and media-fed fear of anything that has to do with guns," Hammond said. The day after Rice's death, black legislators in Ohio tried to regulate the guns, introducing a law requiring all BB and pellet guns sold in the state have special markings or be brightly colored. The bill died in committee. 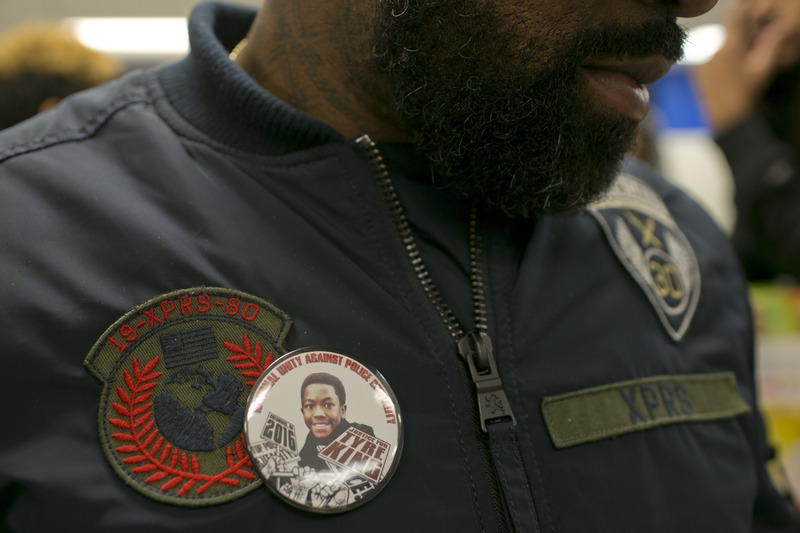 Two years later, police shot King. "Why is it that a 13-year-old would have nearly an exact replica of a police firearm on him in our neighborhoods, an eighth-grader involved in very, very dangerous conduct in one of our neighborhoods?" Columbus Mayor Andrew Ginther (D) said at a news conference after the shooting. In 1983, 5-year-old Patrick Andrew Mason was alone in his Stanton, Calif., home when an officer called to the unit to do a welfare check mistook the boy with his red toy gun for a burglar; the boy was fatally shot while his single mother was away at work, according to news reports. In 1988, officers in San Francisco responding to a report of shots fired mistook a plastic toy gun for a .22-caliber pistol and shot a 13-year-old mentally disabled boy in the head, killing him. Parents began to push manufacturers to make the guns appear less realistic. Retailers such as Toys "R" Us stopped carrying realistic toy guns, and toy manufacturers began adding an orange plug to toy guns. After several states restricted the use of imitation firearms, Congress in 1988, passed a law requiring the bright orange barrel plug on all toy guns. The law applied to water guns, many replicas and Airsoft guns that fire nonmetallic projectiles, but exempted BB, pellet guns and replicas of antique firearms. "It is clear from this study that the orange plug marking system does not help police officers distinguish between toy guns and real guns," concluded the 1989 report, which was managed by the National Institute of Justice. "If they are told there's a person with a gun acting in a threatening manner, that's what they respond to," said David L. Carter, a professor at Michigan State University. The second study a year later reached the same conclusion, saying that police response when confronted with the guns was linked to environmental factors — such as what a police dispatcher tells an officer. Calls for service in a high crime area, for example, might lead officers to consider "a worst case scenario," said the report, overseen by the Police Executive Research Forum. Last year, Congress revisited the issue when Sen. Barbara Boxer (D-Calif.) introduced a bill that would force the country to enact laws similar to California's, which requires the entire surface of all toy and BB guns be painted a bright color. Can you tell which guns are real? "No child should ever die because a police officer or anyone else mistakes a toy gun for a real weapon," Boxer said in a news release at the time. Baltimore's City Council this month passed a similar ban, responding to an April shooting and wounding by police of a 14-year-old carrying a BB gun. In 2015, Boston outlawed imitation firearms in public. The law allows police to confiscate those guns, seizing 139 this year. Boston Police Commissioner William B. Evans said if a facsimile gun has been used in a crime, police will charge a suspect with possession of a real gun. "They are the exact same unless you have it in your hand and take it apart," Evans said. In March in Gainesville, Fla., Alachua County sheriff's officers were called to a parking lot where they encountered 16-year-old Robert L. Dentmond, armed with what appeared to be an AR-15 assault rifle. "I'm finna have the police shoot me," Dentmond wrote. "Drop it now, or you will be shot!" officers yelled. After 24 minutes, Dentmond leveled what looked to officers like an assault-type rifle and began walking. Nine officers opened fire and didn't stop until the gun fell from his hand. He died at a hospital. After the shooting, police saw Dentmond's weapon had broken in two, according to a state report. When picking up the pieces, an officer noticed that their weight "did not feel right" and they seemed to be plastic. Officers did not learn until the next morning that Dentmond's gun was a toy, an Airsoft rifle with the orange tip removed. "Every single one of them — some of them very graphically — grieved the loss, even if they would sit here and tell me they did the right thing," McDougall told The Post. A grand jury investigating the shooting cleared the officers and suggested the state ban imitation firearms. "It is dangerous and unfair to all for law enforcement to confront a situation where to all appearances a real weapon is involved, only to be subjected to intense second guessing after the fact when that turns out not to have been so," the jury said. Dentmond's family could not be reached for comment. Todd told The Post police could have done more. "He was only 16 years old. He didn't need to die," she said. Three months later it almost happened again. The department sent every available unit, who quickly came upon a black Honda Civic and a black Toyota Camry. Men wearing werewolf masks were hanging out the cars' sunroofs waving what appeared to be Heckler & Koch MP5 machine guns, according to Darnell and records. Police disarmed the men. The guns were plastic toys, and the gunmen, university students making a movie for a film contest. "This is what those of us in law enforcement are so concerned about," Darnell said. "You never know what's real or what's not, so part of the solution is to ban the sale of toy or replica guns." Most of the shootings are of white men with BB guns. Complicating the matter is that the officer, Bryan Mason, had been involved in three shootings since 2009, one of them fatal. In 2012, Mason shot and killed a man who was pointing a firearm at another person. In all cases, Mason's use of force was ruled justified by the department. Jacobs said Mason would not be allowed to comment until the conclusion of the investigation. "You go to work and you do your job, and then all of the sudden you're under criminal investigation," Jacobs said. King's family has no sympathy for Mason. "Ain't nobody held accountable," said his father, Maurice Cardwell. "There's no wrongdoing over there it seems. And you're killing kids?" After King returned from school that day he, finished his homework and left his house. At 7:42 p.m. witnesses called 911 to report a robbery. The callers said a gunman wearing a hoodie and baggy pants fled the scene. The robbery victim came on the line and told dispatchers, "I'm not going to mess with it over $10." Another witness said seven or eight armed men were running away with police chasing them. "Oh, he's shooting them. Oh my god," a caller said, apparently describing police shooting King. Chanda L. Brown, an attorney for the family, said they had serious doubts that King was involved in the robbery and that he did not own a BB gun. Police have not disclosed the source of the gun. Brown said that she believes King was shot running away, not pulling a gun. The only person charged in the robbery is Demetrius E. Braxton, 19. His attorney, Lodema M'Poco, told The Post last week that Braxton admits he used the gun to commit the robbery while King and others waited nearby. M'Poco said Braxton then passed the gun to King, who put the weapon in his pants. Braxton said that after police ordered him and King to the ground, King ran and Mason shot him. M'Poco said Braxton did not see King pull the BB gun from his pants. Braxton pleaded guilty last month to felony robbery charges. In court he described the episodeas a "lapse in judgment. As the oldest, I should have been the one to tell everybody, 'Let's not do this,'" the Coumbus Dispatch Newspaper reported. King family attorney Brown said police failed to train officers how to deal with children with BB guns. "Anyone that takes the blame and puts it on a 13-year-old instead of an officer that's been trained — or should be trained — in how to evaluate and respond to situations like this, I think they're missing the bigger picture here," Brown said. "Shooting should be the last resort." "People don't really understand the dynamics of a police-involved situation, how fast they occur," Jacobs said. "They all have families, they want to go home at the end of their shift." Lee Powell, Teaganne Finn, Josephine Peterson and Taylor Hartz contributed to this report. This article was produced in partnership with the Investigative Reporting Workshop at American University, where Courtney, Houston, Finn, Peterson and Hartz are students. Photo research by Teaganne Finn.